Alphonso mangoes maturing on a tree in Devgad, India. If Alphonso is the “King of Mangoes”, then the Alphonso grown in Ratnagiri and Devgad (on the west coast of India) is undoubtedly the “King of Kings”. Slightly North of Goa is Devgad, while Ratnagiri is about 100 kilometers North of Devgad. Both regions vie for the Best Alphonso mango on planet Earth!! What is so special about Ratnagiri and Devgad? The location, soil, topography, weather and of course generations of knowledge about their mango make them unique. While scientists can research about what makes these mangoes so special, mango enthusiasts already know- they are the best tasting alphonso mangoes one can find. The mangoes grown in Ratnagiri and Devgad are protected by GI (Geographical Indication)- legally no other Alphonso can masquerade as the alphonso grown here. Who made Alphonso the King of Mangoes? 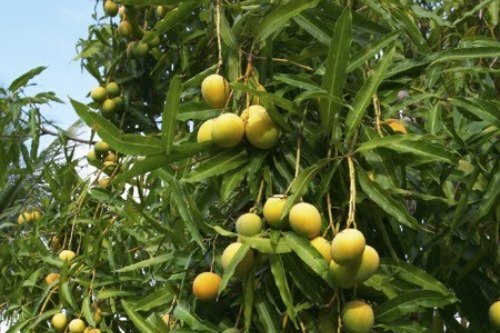 Typically, the first flowering of mangoes is ready in February. A lot depends upon the weather- warmer weather has been causing early flowering lately. We get our fruit from the second flowering- this starts in early April in Ratnagiri and lasts till mid-May. In Devgad fruit matures by mid-May and is over in a few weeks. Overall, this is a 6-8 week season. What is the difference between Ratnagiri and Devgad alphonso? In our experience, we find that the Ratnagiri alphonso is smaller in size, and has a more delicate skin which shrivels more when the fruit is ripe. The Devgad alphonso is larger in size and has a thicker skin which does not wrinkle easily (although that also shrivels uniformly when ripe)- this also gives a better look. The Ratnagiri alphonso develops its flavor early in the ripening process and then fine tunes it as it ripens. So a no-so-ripe Ratnagiri alphonso will still taste good. The Devgad alphonso comes into its element later during the ripening cycle, so if you eat it unripe, there is a good chance that it will taste sour. In its prime, no other fruit evokes such awe and wonder! It has the power to change your consciousness forever. During the mango season, Indians attain nirvana daily by eating this mango!! They also spread the experience by gifting this mango to others. They broadcast this secret openly- you wouldn’t know know unless you tried!! Not Just Any Alphonso- Ratnagiri/Devgad Alphonso! !